IPS Virtual Paint is the first software capable of performing accurate spray painting simulations in only a few hours on a standard computer. Our customers in the automotive industry use the software in the product preparation phase to fine-tune the robot paths and process parameters, to optimize the process to be more environmentally friendly, more energy and cost efficient, and increase product quality. The surface treatment is the process in an automotive factory that consumes most energy, water and chemicals, and produces most waste and pollution. Not only does it have a large environmental impact, it is also often a bottleneck in production. To improve the situation, the costly trial-and-error procedure used in the automotive industry today needs to be replaced by virtual tools that support an effective product and production realization through systematic computer simulations. 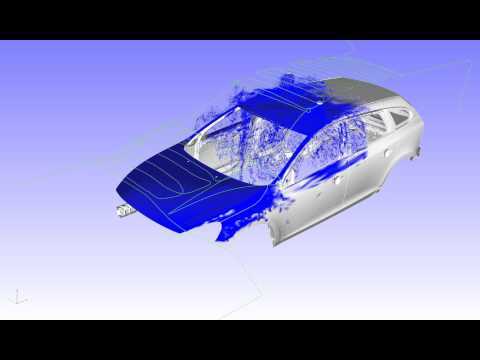 The IPS Virtual Paint software makes it possible to accurately simulate spray painting of a complex automotive part in only a few hours, and a full car simulation overnight, on a standard computer. This is an extreme improvement compared to earlier approaches that require weeks of simulation time. Unique algorithms for coupled simulations of air flows, electrostatic fields and charged paint particles have made this possible. This implies that a large part of the production preparation process can be performed in the computer, which allows the engineers to replace physical prototypes with virtual ones to shorten the lead time in product development, and avoid future unforeseen technological and environmental problems that can be extremely costly if they are discovered at the end of the production line, or even worse by the costumer. The software is continuously being extended and today supports both wet paint and powder applications with electrostatic rotary bells as well as guns. The user-friendly GUI is tailored for paint process engineers and the software offers a very efficient work process where the time needed to set up a simulation has been minimized. The software is a result from a long term research project in Sweden supported by Vinnova involving Volvo Cars, AB Volvo, Scania CV, Swerea IVF and General Motors NA. The software is commercially available since 2014 and distributed by IPS IBOFlow AB.